Mindful yin yoga combines the influences of mindfulness, Indian Yogic practices, Chinese Daoist principles with western science to improve our health on many levels. With its emphasis on slow paced, floor based asana, mindful yin yoga increases flexibility in the back, hips and pelvis, mobilises and strengthens the joints and allows body and mind to drop into deeply nourishing relaxation. Mindfulness is a way of paying attention, on purpose and without judgement, to what goes on in the present moment in your body, mind and your outside environment. 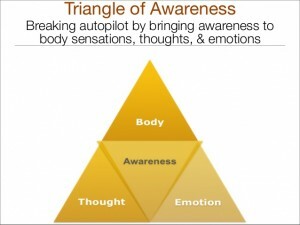 It involves intentionally stepping out of ‘automatic pilot’ to be present, aware and responsive. We learn how to observe the breath and use this as a way to focus on the present moment, allowing thoughts and feelings to arise and sitting with them, without getting “involved”, before letting them fade away. Body – to find you middle path of not too tight, not too loose. Is there something you can let go of? Or perhaps your body is asking you to surrender to some limitations and work with others? If you breath is ragged or if it just doesn’t feel good, these are cue for you to come out of an asana. Thoughts – has your mind wandered (it will, that’s what minds do). Are you caught in your ‘story’ and practicing mindlessly. Are you judging your bodies on the basis of what you can or cannot do? Try to put the awareness of your breath as the centre of your practice, you may need to bring your awareness back time and time again. Emotions – do certain asanas make you feel angry, frustrated or sad? Perhaps you bought these emotions onto the mat. What would happen if you changed your breathing? Try gentle Ujjayi to bring calmness and balance, a longer exhale to reduce anger or anxiety, the heart breath (inhale and exhale for the same duration, without force), for sadness. In Daoist principles, ‘yin’ is about yielding, being, letting go. Much of our daily life is spent being in a ‘yang’ state, busy, striving, doing, achieving. We need a balance of both for a healthy life and this practice gives us the permission and space to slow down and experience our yin nature. With the forward bends in particular, the relaxation response is initiated leaving you feeling deeply relaxed. • Play to our edges – each time you come into an asana, go only to the point where you feel a resistance in the body. Give you body a chance to open up and if you are invited to go deeper, only then do so, listen to your body. You will feel the body being stretched, squeezed or twisted. If you experience: PAIN, BURNING, SHARP STABBING, PINS AND NEEDLES come out of the asana and rest in child’s pose. Within a class, we start with a short meditation, pranayama (breathing exercise) or guided visualisation, practice a number of floor based asanas where we sink in for up to 5 minutes, ending in a final relaxation in savasana. Bolsters, blocks and other supportive accessories are used. All abilities are welcome, you don’t need to be flexible or have practiced yoga before. Perhaps you may have practiced a ‘yang’ style of yoga for years and keen to complement your practice. Mindful yin yoga classes are offered in small groups to ensure a sense of comfort and ease. You will pre pay for 6 classes in advance (I am unable to offer a refund for any missed class, unless there are mitigating circumstances). There is a drop in option available at £12 per class, if there is space in the class (call me on the day to confirm). Please bring a cushion and blanket, I supply all mats, bolsters and blocks. Our nervous and energy systems are under a constant barrage of stress and triggers which drain us, lead to sub optimal health and rob us of vitality. It might be an accident, illness, past trauma, something that just feels stuck and you are ready to let go of, leave behind. Wherever your starting point, we enjoy a 5 week journey together towards good health, restoring agency and certain transformation. We then sink into our yin yoga practice, followed by yoga nidra meditation and understand how these practices help ease the hypervigilence in the nervous system and support the process. We then come together and an opportunity to share insights or not, as you feel comfortable. The groups are small to ensure you feel comfortable, heard and supported. Once monthly I offer a mini retreat offering both the potency of yin yoga and yoga nidra meditation and themed with a different subject each time, exploring flower essences, essential oils, total bliss out, women’s cycle and seasons and insights into the physiology of stress. This mini retreat gives us the space to simply slow down and take a breath, release the week past and prepare for the week ahead. Contact me for dates, or check Facebook events. Collaborating with a local Gong Practitioner, Alison and I invite you to our series of nourishing retreats of pure rest and relaxation, combining yin yoga and gong bath practices, to melt away tension, worries and concerns, leaving you feeling deeply nurtured and refreshed. We open space and settle into the retreat by exploring a different theme which will start the process of relaxation and reminds us of the value of self-care in today’s fast paced life. You will then be led into a 75-minute yin yoga practice, in which we sink into floor-based asanas. 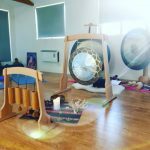 With you lying comfortably on the yoga mat, fully supported with bolsters and cushions, the gong bath will lead you into a deep meditation that invites you to relax, clear and release old patterns, stimulate your immune system, refresh your whole being and discover a state of bliss. Lunch to share. Contact me for dates, or check Facebook events. 1 to 1, private tutoring available. Please contact me for further information.